Tustin, California, March 13th, 2017 – Luxion, a leading developer of advanced rendering and lighting technology and maker of KeyShot®, the first real-time ray-tracing and global illumination program for 3D rendering and animation, today announced that Chip Foose, renowned automobile designer and star of reality television series OVERHAULIN‘, will present the Monday keynote at KeyShot RenderWorld 2017. Chip Foose has a lifetime of automotive design experience, from working as a young boy for his father’s company, Project Design, to creating a worldwide brand and hot-rod designs no one else could imagine. Since the early 80’s, he has developed concepts of proprietary designs and custom prototypes, held roles as chief designer and director of design, and defined the style of many vehicles over many years, until starting his own automotive and product development company, Foose Design, in 1998. Driven by a passion for automotive design and surrounding himself with others of the same mind, he pursues the desire to build the best – to build something no one has seen before. His process was brought to millions in the television series OVERHAULIN’ where Chip and team transformed over 100 vehicles over 9 seasons. Chip’s legacy stretches far beyond the television show, however, with years of style-defining design, honors, awards, and induction into many automotive halls of fame and, ultimately, within the walls of Foose Design headquarters where, together with his wife Lynne, he continues to create the world’s most iconic automobile designs. Luxion is excited to host Chip Foose as keynote speaker at KeyShot RenderWorld 2017, where attendees will have the opportunity to hear his unique insight into product development, learn what drives him and see the passion behind his business and design process. 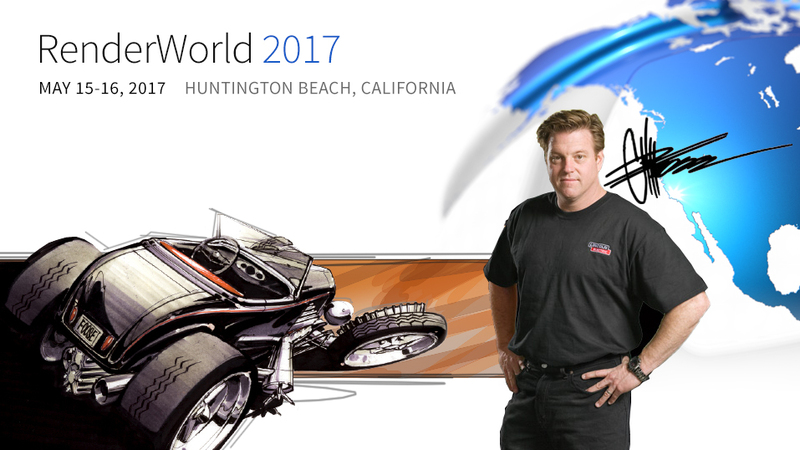 KeyShot RenderWorld 2017 takes place on May 15th and 16th at the Paséa Hotel & Spa in Huntington Beach, California – home to Foose Design’s 10,000 square foot shop, design studio, and showroom. Chip will be speaking Monday, on the opening day of the show, prior to the evening reception. Early bird registration ends Tuesday, March 14th with 20% off individual tickets and 33% off groups of three or more. For more information and to register for the event, please visit https://www.keyshot.com/renderworld/. The preeminent car designer of his generation, Chip Foose has created a legacy of designs and accomplishments that are well beyond his years. Known for his clean designs and sophisticated style, Chip Foose is a living legend in the automotive industry. His customization of classic American hot rods and muscle cars include the iconic and eye-catching Impression, Hemisfear, Stallion and Grand Master. His designs have earned him a place in the Hot Rod Hall of Fame, the Darryl Starbird Rod and Custom Car Museum Hall of Fame, The Grand National Roadster Show Hall of Fame, The Diecast Hall of Fame, the San Francisco Rod and Custom Motorcycle Hall of Fame, and most significantly The SEMA Hall of Fame in 2016. His Foose Design, Inc. headquarters, located in Huntington Beach, CA, continues to produce some of the most exquisite designs the car world has ever seen. Learn more at chipfoose.com. KeyShot RenderWorld 2017 is Luxion’s international user conference that brings together KeyShot users from all over the United States, as well as Europe and Asia. Now in its second year, this two-day event is packed with speakers from companies like Caterpillar, Tesla, Wilson, Sonos, and others, as well as technical workshops hosted by Luxion’s product and training experts. In addition, this event provides plenty of opportunities to network, learn from each other, and interact and connect with Luxion’s partners to experience their products and offerings that will take their rendering productivity with KeyShot to the next level.